This Saturday, July 24th, you can learn about nature's fuzzy flying fertilizers at the Audubon Greenwich's Native & Honey Bee Day. It features a live demo and two movies on bees and the cause of their demise, known as colony collapse disorder (CCD). 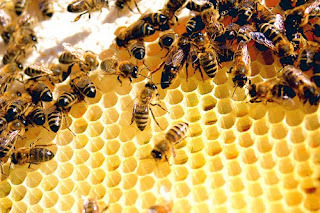 First, from 11am-4pm, there will be a honey harvesting presentation by the Backyard Beekeepers Association where your participation is welcome and honey will be available for sale while supplies last. - "Vanishing of the Bees"
You can read about the movies on their websites or go to the Audubon Greenwich website for more information. RSVP to Jeff at 203-869-5272 x239. The cost for the event is $15, which includes admission to the two films and bee-inspired refreshments (like wine made from honey).